Why Hike the 4-Mile Trail? Because this is where Yosemite Falls gives you the full monty. And if you hike it from bottom to top, you can buy yourself an ice cream at trail's end. Crowd Factor: It's a trail that connects Yosemite's two most popular spots - Yosemite Valley and Glacier Point - so it will have lots of hikers. There are memorable views around nearly every corner, though, so people won't be piling up at any particular spot. 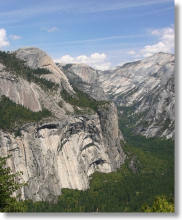 Scenery Summary: There may be no better way to see what's so fabulous about Yosemite Valley than to hike the Four-Mile Trail, which climbs from the valley floor near the Swinging Bridge to the south valley rim at Glacier Point (or vice versa, or both, depending on your inclination). This hike offers great views of most of the landmarks that Yosemite Valley's famous for, and all from angles you're not used to seeing on postcards. The scenery starts slowly from the bottom, since you need to climb above the timber that blankets much of the valley before the views really start to pop, but the early stretches are still pleasant, as you pass lots of moss-covered boulders and, if your timing is good, wildflowers. A mile or so in, you'll start to round corners and see Yosemite Falls in all of its glory. From nearly anyplace else in the world, strategic bits of the falls are coyly hidden by trees or rock, but on the lower half of the Four-Mile Trail, you get to see everything. You'll also see a reverse tunnel view off to the west, with Cathedral Rocks and El Capitan framing opposite sides of the view. 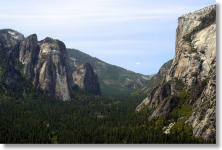 You'll pass almost directly under Sentinel Rock, and once you reach the trail gate (closed in the winter), about three miles (4.5 km) from the bottom, you'll start to see remarkable views up Tenaya Canyon to Half Dome, Clouds Rest, North Dome, and the Royal Arches. You'll also get varying views of Yosemite Falls almost all the way to the top of the trail, eventually reaching the point where you're looking down on them. Difficulty: Call it a 4 out of 10 going down and 7 out of 10 going up. The trail is wide and smooth, and not nearly so steep as Upper Yosemite Falls, whose own valley-floor-to-valley-rim trail is a mile shorter. By the time you finish the second set of switchbacks on the way up, though, you'll know you've been on a hike. Nearest Bathrooms: In the valley, you'll find bathrooms at the Swinging Bridge, about 200 meters east of the trailhead. At the top, they're next to the Glacier Point parking lot. Nearest Snacks: At the top, the trail ends (or begins) at the Glacier Point gift shop & cafeteria, which sells a variety of snacks. At the bottom, your closest options are the Yosemite Lodge, roughly 0.75 miles (1 km) away, and Yosemite Village, 1.25 miles (1.5 km) away. Acrophobe Factor: This trail inspires mixed reports from people with fear of heights (see the hiker reviews), and it's hard to make a definitive statement about whether or not it'll cause problems. The spots that have the best chance of giving you the willies are on the upper half of the trail, so if you're susceptible to heights, you might prefer hiking from the valley up to the rim, which will allow you to enjoy more of the hike before you need to turn around. Or, depending on how you view things, allow the tension to build for longer before you find out whether or not the world is going to try to buck you off. In any case, if you're hiking bottom to top and things start to get hairy, they likely aren't going to improve, so at least you can be confident that it's time to retreat. Doing it in one direction: Because there's road access to both ends of the trail, this is one of those rare Yosemite trails that you have the option of hiking in only one direction, and lots of people take advantage of this. If you don't have multiple cars to set up your own personal shuttle with, you'll need to park at one end and catch the Glacier Point tour bus to the other. The tour buses leave Yosemite Valley - specifically, the Yosemite Valley Lodge - for Glacier Point at 8:30 a.m and 1:30 p.m. 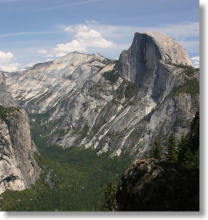 They have historically left Glacier Point for the return trip to the valley at 10:30 a.m. and 3:30 p.m., though it would be prudent to check at the Yosemite Valley Lodge to be sure these times are accurate and that both tours are running on the day you're interested in. One-way tickets are $25 for adults, $23 for seniors, $15 for children over five years, and free for children under five. Round-trip tickets are $49 for adults, $45 for seniors, $35 for children five years or older, and free for children under five. The official details are available at the park concessionaire's website (click on the "Glacier Point Tour" section to see them). If you're taking the bus from Yosemite Valley up to Glacier Point, you can buy tickets ahead of time, and the Lodge recommends you buy them no later than the day before your hike. If you're taking the bus back down to Yosemite Valley, you can't buy tickets in advance - you just show up at the bus at Glacier Point, and if there's room, passengers are allowed to board on a first-come, first-serve basis. There'll be room if the bus wasn't fully booked or if some of the passengers coming up from the valley only bought one-way tickets, usually so they could hike back down the 4-Mile Trail. Especially if you're trying to catch the bus down from Glacier Point to the valley, but to some extent in both directions, your best chance of getting a seat is to catch the first bus of the day. The large charter buses aren't allowed on Glacier Point Road, so the charter companies will often book large blocks of seating on the afternoon tour buses for their passengers, who otherwise wouldn't get to see Glacier Point. Since charter-bus passengers are notoriously allergic to walking, these tickets are almost always round trip. If you're worried about whether or not there'll be room on, say, the 10:30 bus, you can call the lodge tour desk at 209-372-1240 after the bus's 8:30 departure from the valley to find out how many tickets were sold and how many were one-way only, and you'll still have time to drive to Glacier Point from much of Yosemite before the bus departs from there, so you can park at Glacier Point, take the bus back down to the valley, then hike the trail from bottom to top. Where to Buy Bus Tickets: If you're taking the bus down from Glacier Point, you don't actually buy a ticket - you just hand your $25 to the bus driver as the bus sits in the parking lot and hope he'll take it. If you're starting your bus ride from the valley, you can buy them online, over the phone at 209-372-1240, or in person at three places in Yosemite Valley: at the Yosemite Lodge tour desk (in the same building as the main check-in desk); at the "Tours" building next to the Village Store in Yosemite Village; and at the main check-in desk at Curry Village. You can buy tickets as far in advance as you want. Which way is better? Most hikers take the top-to-bottom route. This is certainly the easier path, and if you're in poor shape, it might be your only choice. Scenery-wise, though, it's better hiking from bottom to top. The views get steadily more impressive as you climb higher, and the scenes that seemed jaw-dropping at the bottom of the trail will pale by the time you reach the top. Traveling top to bottom, the last third of the trail may seem anticlimatic. Another alternative is to start at the top, hike down to the trail gate (where the trail gets closed in the winter), and then return. 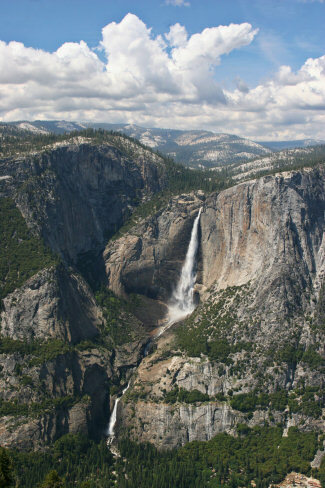 Except for the walking-under-Sentinel-Rock experience and the Yosemite Falls full monty, this will let you see all the best views on the trail in roughly a 3-mile (4.8 km) round trip (and though you miss the full monty, you do still get impressive views of Yosemite Falls). This route has the added advantage of sparing you the trouble of securing a seat on the bus.